I am interested in attending. Is the conference in Cincinnati, Dayton or Toledo? 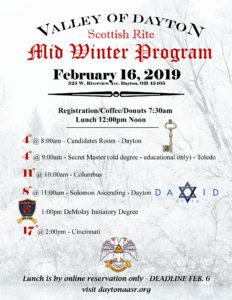 The Midwinter event is in Dayton at the Dayton Masonic Center (525 W. Riverview Avenue, Dayton, OH 45405). Please watch here on Monday, November 26. If one attends the Reunion, are the 8th, 11th, and 17th degrees being presented at Dayton? Yes – Dayton is hosting the other Valleys in our auditorium.